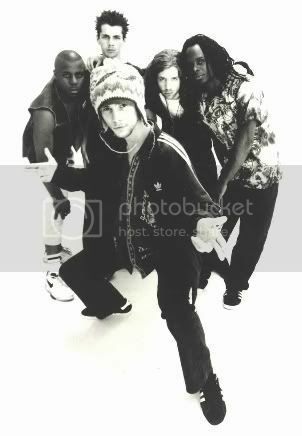 Jamiroquai funk odyssey started in the early 90Ã¢â‚¬â„¢s, when funk-fascinated Jay Kay entered the music industry. Jamiroquai has generated amazing numbers since 1993, having sold more than 21 million albums worldwide. The six albums released have been an important impact in the Funk genre in the last years. Ã¢â‚¬Å“Success is when I see all those people standing out there in front of me having a good time, and knowing that you've got a great album on your hands that you enjoy as much as they doÃ¢â‚¬?, recalls Jamiroquai vocals and leader Jason Kay. Ã¢â‚¬Å“Jamiroquai is the name of a feeling - its about remembering where youÃ¢â‚¬â„¢re coming from and the band is about expressing that feeling through great tunesÃ¢â‚¬? In the 1999 Ã¢â‚¬Å“Vibe, JK NYÃ¢â‚¬? Interview Jay said: Ã¢â‚¬Å“IÃ¢â‚¬â„¢d come in one night and seen this spaghetti western playing on TV. I was stoned. There were the horsesÃ¢â‚¬?, -Kay imitates the sound of jetting hoof beats- Ã¢â‚¬Å“The Indians, and the horns. I could see that all these elements were so like my hat!Ã¢â‚¬? Instantly, he conflated the name of a Vietnam-era helicopter (the Bell 1H2V Iroquois), the Native-American reference Ã¢â‚¬Å“(I did my reading and found out it was part of the six tribes who hang around the New York regionÃ¢â‚¬? ), and the notion of jamming to get to that fairly magical made-up name, Jamiroquai. Ã¢â‚¬Å“I could almost see it thenÃ¢â‚¬? 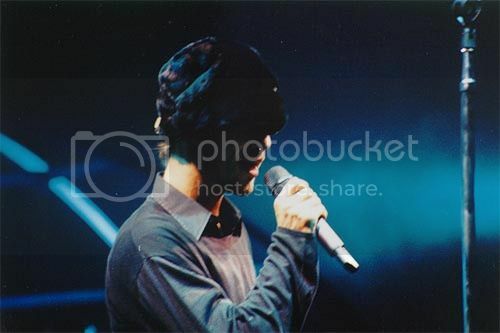 Kay recalls, Ã¢â‚¬Å“Ladies and gentleman, Jamiroquai!Ã¢â‚¬? Jamiroquai is a name derived from the Native American Iroquois tribe combined with 'Jam', as in musical jamming. Another element of Jay's visuals are his hats. He's well know as the "Cat in the Hat" and it's a proper name for a person who wears hats since its a kid. He has wore a significant number of different hats in all colors, sizes, models during all the his career. Buffalo Man is the name of the character featured on all of the British band JamiroquaiÃ¢â‚¬â„¢s album artwork. The Buffalo Man was created sometime prior to 1992. It was originally sketched by the bandÃ¢â‚¬â„¢s primary songwriter and front-man Jason Kay as Buffalo Man is seemingly a self portrait silhouette of Jason wearing a buffalo hat. The mark has been used on every commercial release of the bandÃ¢â‚¬â„¢s output in some form or another; usually the unique symbol is pictured unaltered, but there have been times where it is shown in a stylized manner to suit the artwork or song. With its disco-jazz grooves and JayÃ¢â‚¬â„¢s soulful, Stevie Wonder-like vocals, Jamiroquai has experienced chart success. As the band had suffered several lineup changes during their career, singer/songwriter Jason Kay (aka J.K.) has remained those many years. After moving to East London with his mother Karen Kay, a jazz singer, in his teens, Jay found himself homeless after a fight with his mum. After leaving home at the age of 15, Jay Kay found himself in trouble with the law. Jay Kay decided to return home, after a near-death experience and being arrested for a crime he did not commit, he decided to do something different, it was music. Jay Kay auditioned to be the singer of the Brand New Heavies, and unsuccessfully, he decided to put together his own band. Then, he quickly came up with his future projectÃ¢â‚¬â„¢s name: Jamiroquai. The band consisted of Stuart Zender (Bass), Toby Smith (Keyboards), Nick Van Gelder (Drums) and Wallis Buchanan (Didgeridoo). JamiroquaiÃ¢â‚¬â„¢s first single, Ã¢â‚¬ËœWhen You Gonna LearnÃ¢â‚¬â„¢ Ã¢â‚¬Å“bit of disco, jazz inflections and a didgeridoo in the blenderÃ¢â‚¬? takes on everything from racism to corporate greed. The single was a success and was soon followed by a long-term and lucrative recording contract with Sony. The band's debut album Ã¢â‚¬Å“Emergency On Planet EarthÃ¢â‚¬? crashed straight into the charts at Number One and resided there for several weeks. It followed the single and became a hit in England, throwing such hit singles as Ã¢â‚¬ËœToo Young to DieÃ¢â‚¬â„¢ and Ã¢â‚¬ËœBlow Your MindÃ¢â‚¬â„¢. Nick Van Gelder was voted 67th in the top 100 beats of all time for his drumming on Ã¢â‚¬ËœRevolution 1993Ã¢â‚¬â„¢ in a poll in Rhythm Magazine!. Lately, Nick Van Gelder leaves the band for disagreements with the other band members. Stuart Zender explains: Ã¢â‚¬Å“Yes, Jay really liked his playing because he was quite a solid drummer compared to what he was used to; I guess he was used to drum machines before Nick. But our ideas moved on and Nick's didn't. HeÃ¢â‚¬â„¢s very talented but we couldnÃ¢â‚¬â„¢t really communicate with him. It got to the stage when there was nothing there. It was a breath of fresh air when Derrick (McKenzie) came in. With DerrickÃ¢â‚¬â„¢s attitude in the band weÃ¢â‚¬â„¢ve all got a better working relationship with each other, itÃ¢â‚¬â„¢s all growing. ItÃ¢â‚¬â„¢s not necessarily NickÃ¢â‚¬â„¢s fault that it didnÃ¢â‚¬â„¢t get like that, itÃ¢â‚¬â„¢s just timing. Three bloody years of not holding on to a speeding bulletÃ¢â‚¬?. Already being a fan of the Ã¢â‚¬Å“Emergency On Planet EarthÃ¢â‚¬? album, a friend set Derrick McKenzie up to audition as drummer when Nick Van Gelder left the band. Six and a half hours after his second audition in January 1994, he got the part. The band's second Jazz Funk release, The Return of the Space Cowboy in 1995, is much more interesting than the title song or its mildly engaging video, itÃ¢â‚¬â„¢s crisper, fuller, more relaxed, itÃ¢â‚¬â„¢s managed to steer Jamiroquai clear of the sophomore jinx. SolÃƒÂ¡ AkingbolÃƒÂ¡ joined the band in early 1995 after the previous band percussionist Maurizio Ravalico left. Derrick had heard about SolÃƒÂ¡, contacted him and then went around to his house to talk and listen to some records. After a couple of hours, Derrick was convinced and went back to tell the band that they should bring SolÃƒÂ¡ on board. SolÃƒÂ¡ didn't have an audition and joined the band almost immediately, and the rest is history. JamiroquaiÃ¢â‚¬â„¢s second guitarist Simon Katz joined the band when previous guitar player Gavin Dodds left the band the same year. Previous drummer Nick Van Gelder played drums in the song Ã¢â‚¬ËœThe KidsÃ¢â‚¬â„¢. What always stands out is the music of this album, a beautiful and rich synthesis of sound that incorporates instruments like the Aboriginal didgeridoo with Jazz and Funk, incredible bass lines, and sweet drums. Numbers like Ã¢â‚¬ËœSpace CowboyÃ¢â‚¬â„¢, Ã¢â‚¬ËœScamÃ¢â‚¬â„¢, Ã¢â‚¬ËœMr. MoonÃ¢â‚¬â„¢ and Ã¢â‚¬ËœStillness in TimeÃ¢â‚¬â„¢ really take you away. Ã¢â‚¬Å“IÃ¢â‚¬â„¢ve not been out there as much seeing all the sh*t that goes on like I did when I was struggling Ã¢â‚¬â€œ IÃ¢â‚¬â„¢ve been touring, writing and experiencing so called Ã¢â‚¬ËœsuccessÃ¢â‚¬â„¢ thatÃ¢â‚¬â„¢s not really Ã¢â‚¬ËœrealÃ¢â‚¬â„¢ but itÃ¢â‚¬â„¢s been my reality for a year so thereÃ¢â‚¬â„¢s a lot on the album about what's gone on inside my head as well as what we all see on the newsÃ¢â‚¬?. JamiroquaiÃ¢â‚¬â„¢s more mature work thus far went in 1996: Ã¢â‚¬Å“Travelling Without MovingÃ¢â‚¬?. The album spawned the worldwide hit Ã¢â‚¬Å“Virtual InsanityÃ¢â‚¬? for which an award-winning video was filmed and helped the album achieve platinum status in the States by the year's end (as well as a highlighted performance at the 1997 MTV Video Music Awards). Travelling Without Moving was written by the band and produced by front man Jason Kay with Al Stone. Ã¢â‚¬Å“Its funkier and catchier than our past records. I wanted this to be an up album, with memorable choruses and stronger hooks. ThatÃ¢â‚¬â„¢s something I hadnÃ¢â‚¬â„¢t exploited before.Ã¢â‚¬? Jay Kay explained. Stuart Zender left Jamiroquai during recording of JamiroquaiÃ¢â‚¬â„¢s fourth album Ã¢â‚¬Å“SynkronizedÃ¢â‚¬? because of conflicts with lead singer Jay Kay, which resulted in Kay scraping almost an entire albumÃ¢â‚¬â„¢s worth of new tracks in order to start from scratch with a new bassist. The circumstances behind his departure have never been fully revealed, but Stuart explained that he felt that he (and other band members) were not being fairly compensated financially, and were not being credited for assisting in songwriting. He also stated that he tendered his resignation to spend more time with his family. Jamiroquai contributed a brand-new track, Ã¢â‚¬ËœDeeper UndergroundÃ¢â‚¬â„¢ to the soundtrack for the movie Godzilla in 1998. Nick Fyffe joined the band in 1998 as the replacement for Stuart Zender. Ã¢â‚¬Å“I moved to London and started answering ads in Melody MakerÃ¢â‚¬? explained Nick, to be in a Jamiroquai tribute band, and, while awaiting a response, he read that Stuart Zender had left the band. He rang Jim Carmichael from Freakpower, whoÃ¢â‚¬â„¢d supported Jamiroquai on tour, and asked to put him in touch with them. Soon after, Nick found himself auditioning for the real Jamiroquai. The same day Jay Kay offered the job to Nick, a guy from Melody Maker called him and offered an audition. The guy was speechless when Nick told him he was now the new Jamiroquai bass player. Ã¢â‚¬Å“Well apart from working hard, itÃ¢â‚¬â„¢s because I follow my heart and do what I think is best to do for me, so therefore IÃ¢â‚¬â„¢m sort of. I feel that IÃ¢â‚¬â„¢m synchronizedÃ¢â‚¬?. JamiroquaiÃ¢â‚¬â„¢s guitarist Simon Katz left the band in the year 2000, for the same reasons as Stuart Zender. Simon Katz was replaced by Rob Harris, who co-wrote a number of tracks on the Ã¢â‚¬Å“A Funk OdysseyÃ¢â‚¬? album. After the release of Ã¢â‚¬Å“SynkronizedÃ¢â‚¬?, and a world tour, Jamiroquai has made some changes on its lineup. The brass section, Yidakki and DJ were dropped out of the band, due to JamiroquaiÃ¢â‚¬â„¢s new musical directions. The Dance/Funk computerized album Ã¢â‚¬Å“A Funk OdysseyÃ¢â‚¬? was released in 2001 by the hands of Sony. Soul singer Beverley Knight recorded backing vocals with Jamiroquai in the track Ã¢â‚¬ËœMain VeinÃ¢â‚¬â„¢ and lately, they were touring the world. She performed backing vocals in songs as Ã¢â‚¬ËœLove FoolosophyÃ¢â‚¬â„¢ and Ã¢â‚¬ËœMain VeinÃ¢â‚¬â„¢. Jamiroquai contributed then to the soundtrack of the movie Ã¢â‚¬Å“Titan AEÃ¢â‚¬? with the song Ã¢â‚¬ËœEverybodyÃ¢â‚¬â„¢s Going to the MoonÃ¢â‚¬â„¢. The song continues the electronic vibe the band has been on. Ã¢â‚¬Å“I think Ã¢â‚¬ËœCorner Of The EarthÃ¢â‚¬â„¢ is pivotalÃ¢â‚¬? says Jay Kay, Ã¢â‚¬Å“It sums up where I live really. It sums up where I am and I think it speaks for anyone whoÃ¢â‚¬â„¢s in a place or a moment where theyÃ¢â‚¬â„¢re happy. Its a spiritual song in a sense. I really am quite proud of it, I think lyrically it flows and twists really nicely. I think Ã¢â‚¬ËœYou Give Me SomethingÃ¢â‚¬â„¢ and Ã¢â‚¬ËœLittle LÃ¢â‚¬â„¢ are also great for a band like us because theyÃ¢â‚¬â„¢re simple and straight to the point - kind of anthemic. Ã¢â‚¬ËœPicture Of My LifeÃ¢â‚¬â„¢ is just what it says, its how I felt at the time. To be honest I cried when I wrote the words, if that gives you an idea. Because it really is so straight from the heart. And it gets me every time.Ã¢â‚¬? Ã¢â‚¬Å“A Funk OdysseyÃ¢â‚¬? is JayÃ¢â‚¬â„¢s most personal work. On it, he opens up about his relationship with British TV personality Denise Van Outen, about his past cocaine dependency, and about his disdain for tabloid journalists. Toby Smith left the band in May 2002 in order to spend more time with his family and Nick Fyffe left Jamiroquai during Summer 2003. Matt Johnson joined the band in 2002, for JamiroquaiÃ¢â‚¬â„¢s recommendation of previous guitarist Simon Katz. After 4 years off recording, Jamiroquai released their last album Ã¢â‚¬ËœDynamiteÃ¢â‚¬â„¢. Funk charged, incredible basslines, sublime keyboards and groovinÃ¢â‚¬â„¢ drums, Ã¢â‚¬ËœDynamiteÃ¢â‚¬â„¢ is JamiroquaiÃ¢â‚¬â„¢s new proposal. During the recording of Ã¢â‚¬ËœDynamiteÃ¢â‚¬â„¢, a number of different bassists were used, and during early promotional gigs in 2005, Randy Hope-Taylor and Richard Murphy played for Jamiroquai. Paul Turner joined the band in March 2005. Hits like Ã¢â‚¬ËœSeven days in Sunny JuneÃ¢â‚¬â„¢, Ã¢â‚¬ËœStarchildÃ¢â‚¬â„¢, Ã¢â‚¬ËœDonÃ¢â‚¬â„¢t Give Hate a ChanceÃ¢â‚¬â„¢ and Ã¢â‚¬ËœTime WonÃ¢â‚¬â„¢t WaitÃ¢â‚¬â„¢ makes this album a beautiful piece of Jazz/Funk with electro grooves. Jay KayÃ¢â‚¬â„¢s supreme vocals in Ã¢â‚¬ËœTalullahÃ¢â‚¬â„¢ really show heÃ¢â‚¬â„¢s still in the touch for composing such beautiful songs and to sing it as he did 10 years back. Jamiroquai is due to release a Ã¢â‚¬ËœGreatest HitsÃ¢â‚¬â„¢ album in fall 2006, followed by a world tour. Jamiroquai is well known worldwide for its live acts, and why is that? Just because of Jay KayÃ¢â‚¬â„¢s amazing dance steps and live improvisation. They have performed so many gigs since they hitted the UK scene in 1993. The amazing solos, improvisations, singing, dances, and all the stuff makes Jamiroquai be one of the best bands actually. Jamiroquai is also well known for the covers they play live: Stevie Wonder, Kool and the Gang, James Brown, Rolling Stones and a few others. Their Yidakki and brass arrangements they did in the past were the beautiful ones. Actually, the sets are more structured, longer, with more songs. 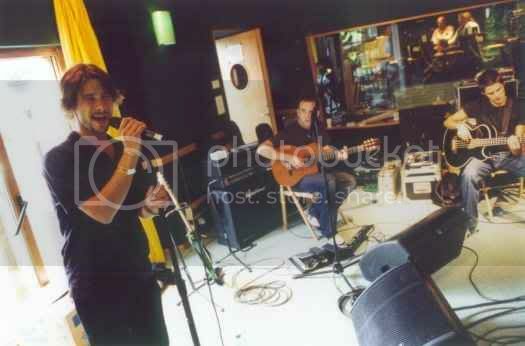 Jay Kay added three backing vocals to his bandÃ¢â‚¬â„¢s lineup in the year 2001 for the Ã¢â‚¬Å“A Funk Odyssey TourÃ¢â‚¬?. Last edited by FunkEducation on Sat Jun 03, 2006 7:47 am, edited 1 time in total. you have done great job!!congrats!! not as good as your recopilation..
a world tour? dear me. i have to make sure i get to it then. 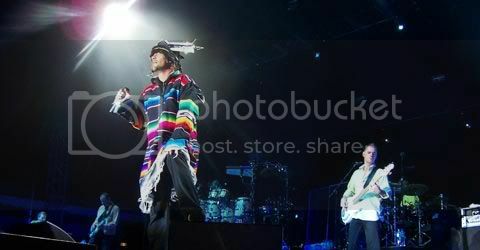 if this would be possibly the only time i'd get to see jamiroquai live in my life, i'd have to go. its like... well missing out on seeing van morrison if he ever came here. Nice story for a book. Isn't it? wow i wasn't seem these thread, you know everything about jamiroquai. ThANks for an excellent bio. It cleared up quite a lot for me. Have been looking for a bio like this for ages. What are these world tour rumours... Hmm... EXCITING. (cleopatra) wrote: :) ThANks for an excellent bio. It cleared up quite a lot for me. Have been looking for a bio like this for ages. What are these world tour rumours... Hmm... EXCITING. No Really I meant that. I've been trawling the net for a concise (but full) biography of the band and hadn't found one anywhere till I came here! Great job (esp if you are a second language speaker). BTW that Biochannel link is not as good. (cleopatra) wrote: No Really I meant that. I've been trawling the net for a concise (but full) biography of the band and hadn't found one anywhere till I came here! Great job (esp if you are a second language speaker). thank you so much guys! really appreciated! thank YOU!you're the one that wrote it! hehehehehe! sorry to embarass you! but in fact, we're the ones that appreciate it. ah then.than you to us all! Thank you FunkEducation. Made me cry when you said Jay cried when he wrote Picture of My Life. Made me cry when I first heard it too. Bet Jay's not a happy bunny now either. Still mourning his dog. It's so sad. Oh well, life goes on for some of us - there's still so much to look forward to! Most things Jamiroquai play make me want to jump about like a mad thing! that's a great job ha ? Wow, thank you, FunkEducation, for this wonderful article. Jay is honest as always. I love that about him. Everything he does or says comes from the heart.